VINTAGE COSTUME ESTATE ANTIQUE JEWELRY EARRINGS! Les Bernard Gum Ball Gold Tone Vintage Dangle Clip Earrings For Weddings, Proms, Pageants And Parties! 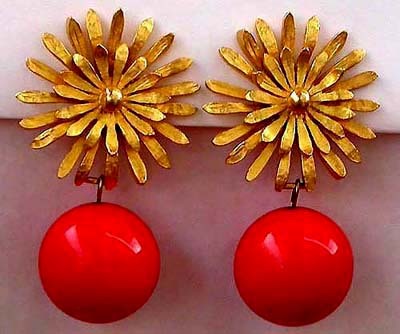 Item #E16869 - Les Bernard Gum Ball Gold Tone Vintage Dangle Clip Earrings. Designer: Signed LES BERNARD TM. Are these just the cutest things you have ever seen! The huge goldtone sun flower covers most of the ear and dangling from it is a perfectly round, smooth, lustrous, irresistible orange ball! It reminds me of gum balls, so sweet and good enough eat! The sun flower measures 1 5/8" in diameter. The orange ball measures 1 1/8". Very showy. Clip backs. Excellent condition. Fabulous earrings for weddings, proms, parties and special functions! US$78.00. SOLD.